I was browsing around recently and found the above picture posted on Comedy Central's "Tosh.0" site. 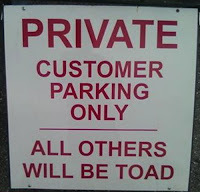 It's funny how homonyms get so many people in trouble. My only question is this: If I find fifty dollars, will I have to use that money to get my car out of impound? And yes, I agree that those living within the United States should use English as the language of choice when in public or doing business. English is the international language of business, so it only makes sense. But, I would certainly expect that if a person is motivated to create a sign that might only serve to anger and inflame others, they would also be motivated enough to seek some form of education beyond 4th grade before doing so. 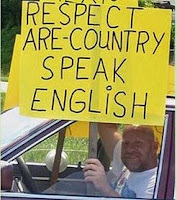 Failure to adhere to basic rules of grammar and usage only result in the sign holder looking ... uh, ignorant. 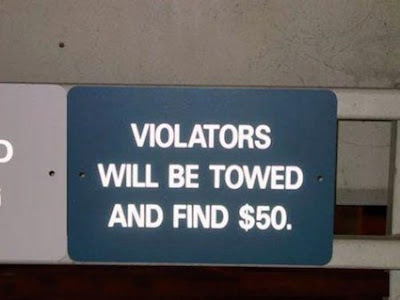 Or what about the sign below. Doesn't a church pastor have to go to college? I guess the mistake could be justified by the fact that the word "family" is not in the possessive or plural form anyway. 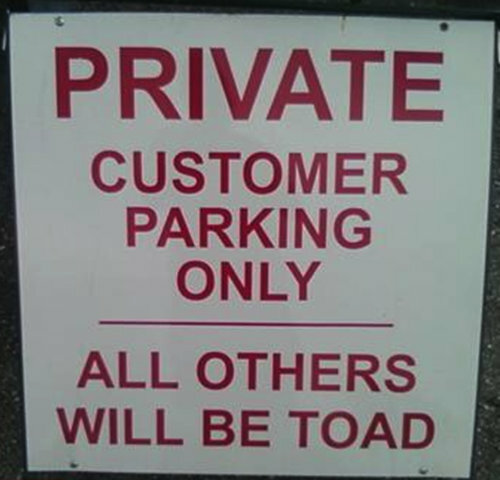 And, just imagine the large number of people who've seen this sign, and then spent the rest of their lives with a gross misunderstanding of what a "toad" was. I just bring all this up because I know that, just like everyday folks have trouble with word spelling of homonyms, super fantastic authors have the same problems. I've been completely derailed when reading a novel and found just one instance of the mistaking the spelling "There" for "Their" and I can only assume others do too. That's why editing is so important when writing. I was so obsessive about proper editing that I used an editor for my novel after I performed my own editing eight times. My editor went through the manuscript a few times more finding numerous mistakes in spelling, word usage, tense, and movement at each look. I'm sure there are still some mistakes somewhere within the pages of my novel, but no glaring mistakes (I hope.) It's always best to seek the help of a qualified editor for your work, even if it is just your spouse or parent looking at your homework. Or, you can use "The Perfect Word" editing services and Tammy Parks like I did. Either way it's important to check your work so you look professional. I don't know. I'm just sayin'. This was quiet(misspelling intended) an article. Thanks for your insight. Or was it "insite" or "incite." I do the homonym switch a lot when I'm in a hurry. Those are great examples you found! That was a funny picture. 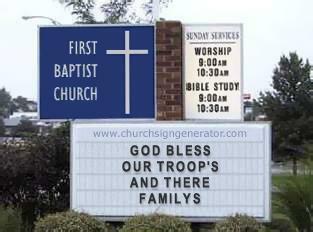 Thank goodness for spellcheck on Word, though it doesn't catch all the wrong ones. I'm surprised you didn't mention that "there" should be spelled "their".